A Norfolk Southern and a Adirondack Northern engine passed our house today around 2 pm heading south. 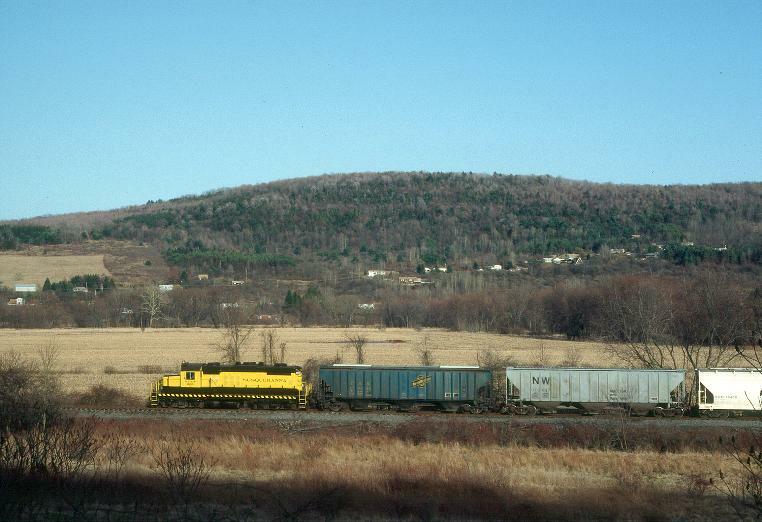 Thanks ut-1, where did they drop the hopper car off , Sangerfield ? My wife said another train went by today at about 1:30pm heading north.She wasn't sure what it was hauling. i dont know if true or not i heard that the line was damage by recent flooding? if it is where? ricky wrote: i dont know if true or not i heard that the line was damage by recent flooding? if it is where? I heard at MP209, 218, and possibly around 219. Does anybody know what's going on at Kerry in Norwich? They are doing work on the backside of the plant along the railroad tracks.Looks like they may be putting in a siding for rail service. milkman wrote: Does anybody know what's going on at Kerry in Norwich? They are doing work on the backside of the plant along the railroad tracks.Looks like they may be putting in a siding for rail service. i wish i knew but if they are going to have rail service their someone better move that big dumpter from kerry out of the way? They're not putting in a railroad siding, I went by there yesterday and saw them working on the roof.Wishful thinking on my part. NYSW doesn’t own the Utica line track and rarely runs trains on it. NYSW could easily prosper with this track out of service for the long run.